Rodin's activity as a printmaker was mainly concentrated in the mid-1880s when he made thirteen drypoints. He learned the technique from Alphonse Legros while visiting him in London in 1881. Victoria Thorson, author of the catalogue raisonné of Rodin's prints, traces the artist's distinctively vigorous approach to printmaking to his work incising decorative detailing on ceramic works at the Sèvres manufactory. Roger Marx, the first cataloguer of Rodin's drypoints, wrote in 1902 of the sculptor's immediate grasp of the potential of the drypoint technique, and compared the physical effort of chiseling the image in the plate to carving marble, noting that drypoint lines 'transparently reveal the artist’s battle'. 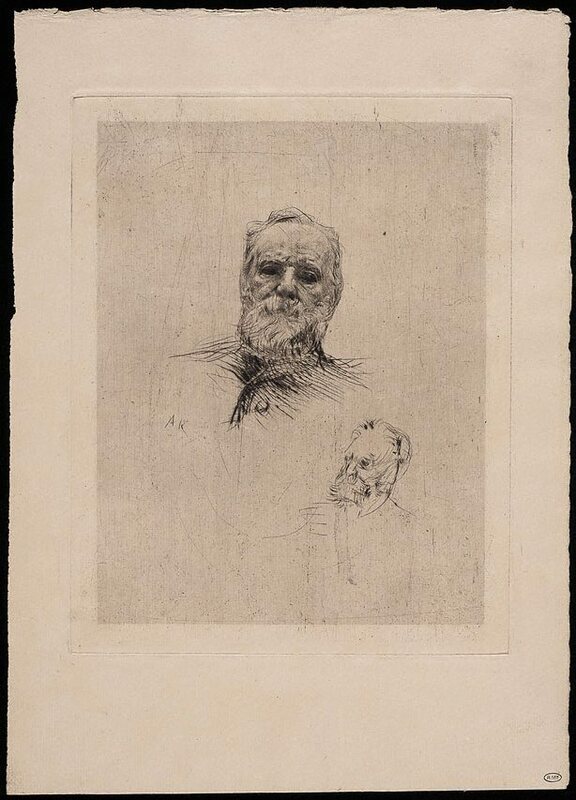 Rodin met Victor Hugo in 1883, two years before the writer's death. Initially Hugo refused to sit to Rodin but eventually allowed the sculptor to visit and observe him at home. Rodin produced numerous rapid sketches of the old man. His first impressions of Hugo were dominated by his deepset eyes, a striking feature of the present print. 'Hugo had the air of a Hurcules', wrote Rodin, '(he) belonged to a great race. Something of a tiger or an old lion. He had an immense animal nature. His eyes were especially beautiful and the most striking thing about him'. In 1884 Rodin exhibited a bronze bust of Hugo at the Salon, the result of his sessions sketching the writer at home. Thorson maintains that the drypoint was made from the bronze by pointing out the reversal inhernent in the printmaking process of several features of the bust, such as the line of Hugo's coat, which closes to the right in the bronze. Signed c.l., [incised plate] "A R". Not dated.